We have been swimming for almost 12 hours but at last, it has dawned. It is only a few minutes before the first rays of sun appear on the horizon. The moon continues to illuminate our path. Dawn with a full moon! The idea of ​​swimming during the day excites me. We stop, as every half hour to drink some water and when we start again I hear Nora screaming “Mariel, a shark!” Again, but louder, … “Mariel a shark, it’s under us!” In that instant, the universe froze. 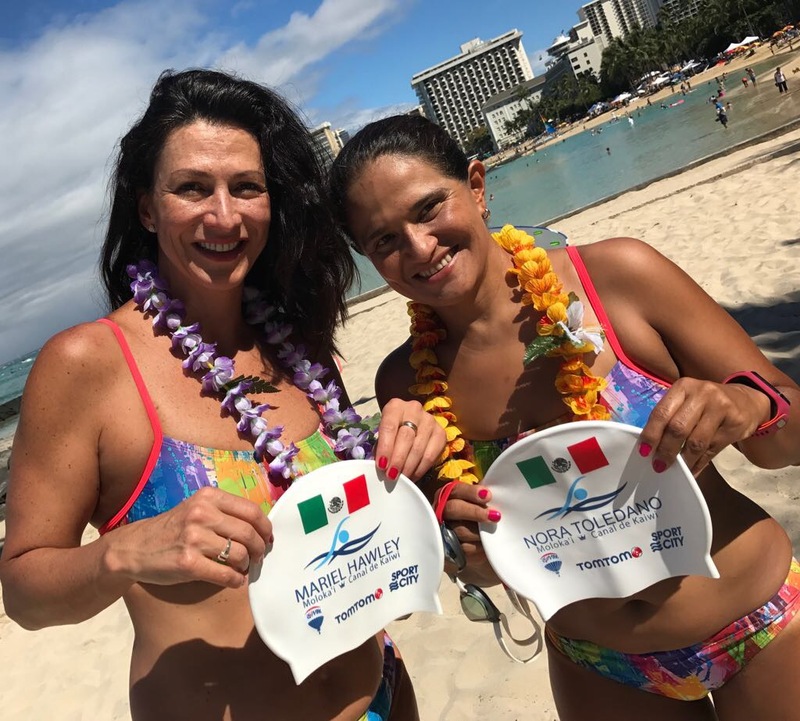 When we started swimming, at 6:15 p.m. on July 9, 2017, both Nora Toledano and I knew it would be a long swim. We would start with the afternoon sun but it would quickly become night. And that’s how it happened. Night fell quickly and that blue sea in which we began to swim became a totally black sea. 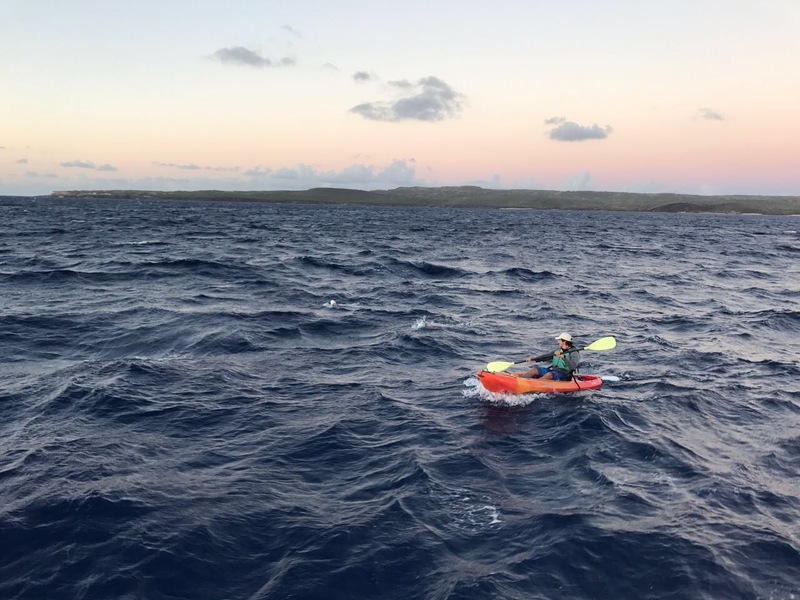 The bubbles which we created with the movement of our arms and the reddish light that shone on the tip of the kayak that accompanied us to mark the route, were barley visible. The guide boat was in front of us, advancing about 600 meters and with the waves, there were times when you could not see it at all. In the midst of this absolute darkness, a dim light struggled to illuminate the clouds that remained behind us on the horizon. It was like an amber color, and in a few minutes, between the clouds, appeared the moon. Its silver glow accompanied us all night, illuminating the crests of the waves and giving the sea a silver appearance that was guiding us towards dawn. We continued swimming, and I began to think that we have probably been swimming for twelve hours already, and although I did not know how much time was left, I thought to myself how very fortunate we were to have successfully survived the night, the waves, the dizziness, the wind and now the dawn was arriving in the most beautiful way that I know, a sunrise with a full moon! The sea was shining with the morning clarity and again took on the most beautiful shade of blue my eyes had ever seen. It looked like we were swimming in transparent blue ink and in the middle of that transparency, we did not even notice the jellyfish that had burned us with their electric touches and remained stuck to our skin causing intense pain which was only mitigated by the idea that we were approaching the other side of the Kaiwi Channel. During the night, I got very dizzy and had nausea. I swam between the kayak and Nora and I did not manage to have a fixed point of reference. Everything was movement. Even when I lifted my head towards the front to see the guide boat, in the distance I saw a tinkling light that also moved and it seemed like even the moon along its orbital route, was moving fast; however, Nora was very patient in the moments that I asked that we pause for a few seconds to breathe deeply to control the dizziness. She is a great friend and swimming partner. 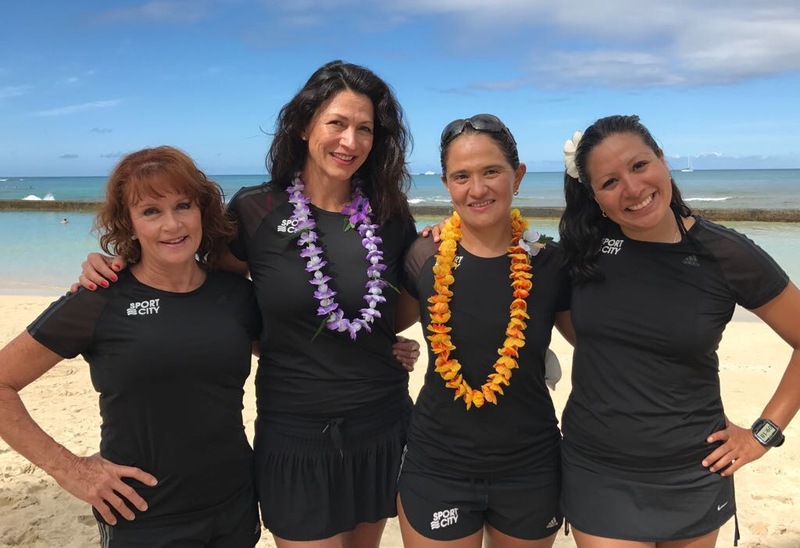 Every half hour we approached the boat to drink liquids and re-energize our bodies to keep swimming and at one of those stops, I commented that I was very dizzy, and Nora and our crew, Gela and Arleen cheered me to keep on going, that’s what we did, we kept swimming. By the time the sun was appearing on the horizon, I was feeling great. They say that the shark simply came to browse, that it is part of the experience of swimming the Kaiwi Channel. They say that if you want to swim Kaiwi Channel, you must face and overcome many monsters! They say one of those monsters is a shark and that you have to face it head on. They say that the dizziness caused by Kaiwi Channel is like when life’s tides make you dizzy and somehow, you have to beat it. 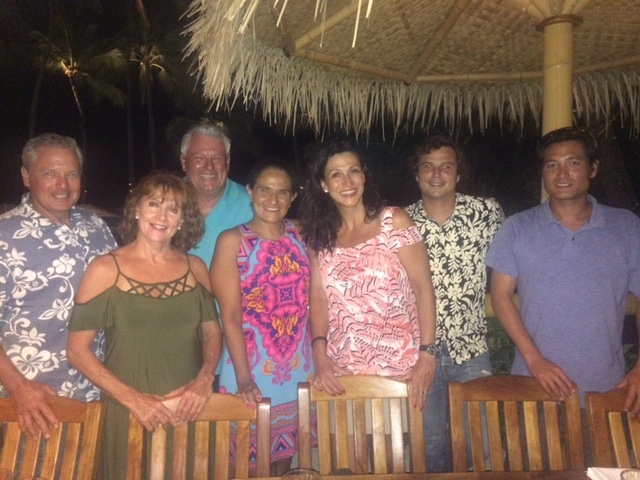 They say a shark is good luck, that swimming Moloka’i makes you stronger and much more yourself. 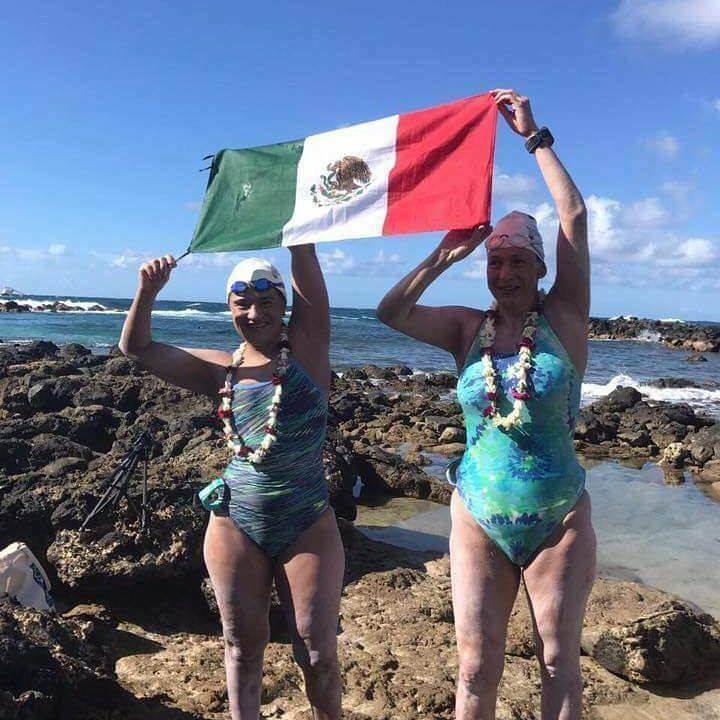 I don’t know about all that, what I do know for certain is that Nora and I swam in a sphere of blessings, gratitude and love, that protected us during that long swim until at 14 hours with 28 minutes we came out of the water at Alan Davis Beach in O ‘Ahu, with a necklace of flowers and a sea-filled hug! 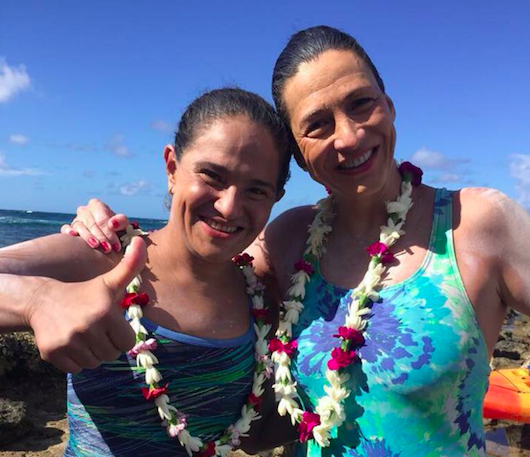 Nora, today I’m still enjoying our Kaiwi Channel swim, and very proud of our hard work! Thank you Gela and Arleen for being the best crew and cheering friends! Thank you Mike, Chris and Mike and Adam for guiding us through the Kaiwi Channel.